I f you could design your ideal workspace, what would it look like? That’s the question we’ve been posing to everyone from CEOs and product designers to architects and essayists. And while we expected everyone’s responses would be different, we hadn’t quite anticipated how different. Some people, like letterer, illustrator and type designer Jessica Hische, prefer a cozy corner in a café, while others, like best-selling author Chuck Klosterman, prefer something a little more surreal. 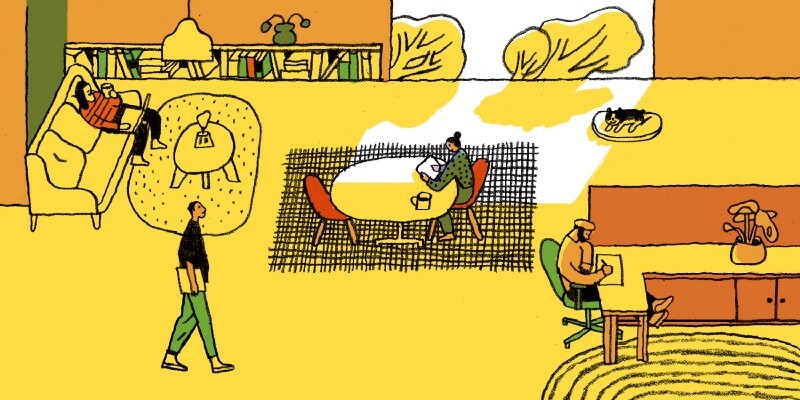 To capture these imaginative ideas, we commissioned several talented illustrators to draw up the spaces our respondents dreamed up, and we’ll be sharing them here periodically. Kicking us off are Sara Wood, Vice President of Product Management at Farfetch and Jake Knapp, Design Fellow at IDEO and former partner at Google Ventures, both with illustrations by Josh Cochran. 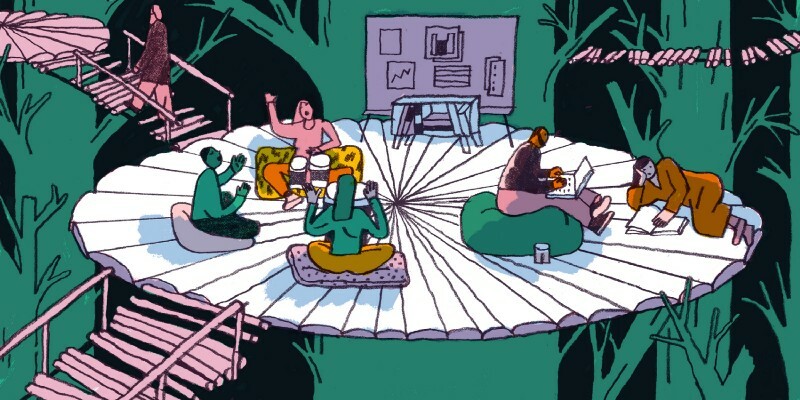 My ideal workplace is an office that facilitates unscheduled conversation, which means a culture that is more human, inclusive and open in nature, but smart and focused at the same time. It would need a mix of quiet and not quiet areas, a mix of comfy seating, shared tables and desks, and a way for people to chat privately and in groups. And not to sound like a snob, but neat and tidy with tasteful design and lighting are essential. I believe things like lighting and clutter impact creativity and productivity greatly. Everybody needs quiet time, and everybody deserves beauty, so the ideal office would be located on the forest moon of Endor. Every person would have her or his own treehouse, with a rope ladder to pull up during focused time. There would also be a mezzanine, like the Ewok village, with common spaces for design sprints and drum circles. There would also be great coffee, healthy snacks, and excellent whiteboards. What would your ideal workspace be like? Share your thoughts with us on Twitter at @slackstories. Lima Al-Azzeh’s perfect workspace is any place with a copious supply of peanut M&Ms.